Alex Ferguson: A Legendary Manager For An Iconic Franchise : The Two-Way Alex Ferguson, who is stepping down after 27 years at the helm of Manchester United, is widely regarded as the most successful British soccer manager ever. 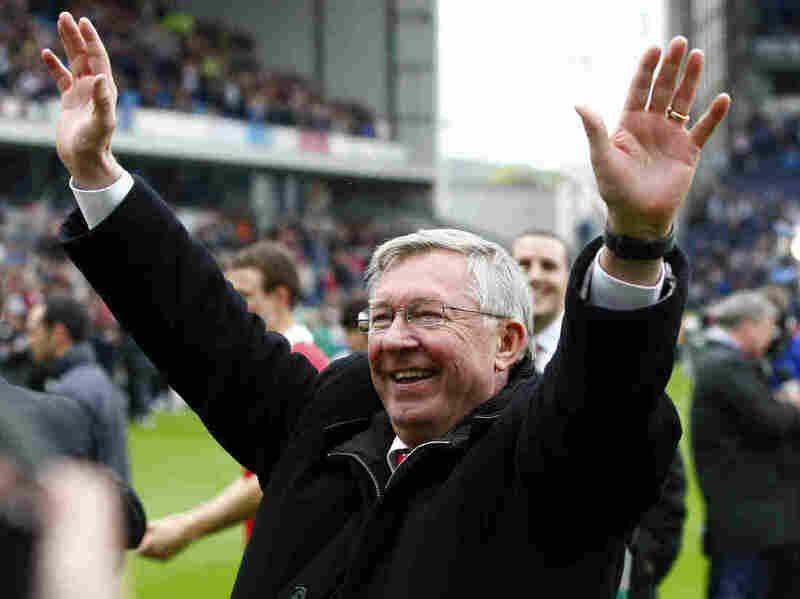 Manchester United manager Alex Ferguson celebrates after his team wins the English Premier League at Blackburn, England, on May 14, 2011. The resignation of veteran Manchester United manager Alex Ferguson is an event causing ripples that go way beyond the island where the Scotsman spent his long and illustrious career. Walk into a bar pretty much anywhere from Buenos Aires to Bangkok, mention Ferguson or his star-studded team of Red Devils, and you can be sure of a lively conversation — and perhaps a heated argument. Ferguson's name is not always greeted with warmth, especially by supporters of rival English soccer teams whom he so often frustrated in the battle for trophies, of which he won an astounding 38 during his Manchester years. He was a tough and highly competitive character in a notoriously ruthless business. In the English game, managers and coaches whose teams fail to perform tend to be sacked with unceremonious speed. It is a measure of Ferguson's remarkable success that he held his job for 27 years. Ferguson's hard-nosed approach was particularly felt by soccer journalists. Those who upset him were banned from his press conferences. For seven years, Ferguson refused to be interviewed by the British Broadcasting Corp. because he was angry about a program it broadcast about him and one of his sons. He could, at times, be abrasive and also outspoken: He knows how to get under the skin of opposition managers before a big game. He has a long record of lambasting referees for decisions he disliked — apparently undeterred by the resulting fines. In fact, his critics frequently accuse him of striking such fear in the heart of match officials that they become biased in favor of Manchester United players. He could be a strict disciplinarian with his team and staff. "He was always falling out with people," Michael Crick, author of a book about Ferguson called The Boss, told the BBC. It is said that in Scotland, in the early stages of his managerial career, Ferguson once fined a player merely for having the gall to overtake his car while driving to the ground. News of Ferguson's decision to leave Manchester United at the end of this season is being greeted with a chorus of tributes from around the world, and a tsunami of statistics about his achievements: two European Champions League crowns, five FA Cups and five League Cups, and more. He leaves on a high — this year, for the 13th time on his watch, Manchester United won the highly prestigious English Premiership title. In England, Ferguson's departure came as a surprise — and prompted a wave of emotional calls to radio phone-ins from Manchester United fans. But it has been the subject of discussion for years. There is speculation that his health perhaps played a part: He is reportedly due to have a hip operation soon. Ferguson made the announcement with a statement saying that this is the "right time" to go, and paid tribute to the Florida-based Glazer family who own a controlling stake in Manchester United. "The decision to retire is one that I have thought a great deal about. It is the right time," Ferguson said. "It was important to me to leave an organization in the strongest possible shape, and I believe I have done so." Ferguson leaves his post at 71, after a career that began in Scotland as a player (he was a forward at Glasgow Rangers in the late 1960s), and ended as the most successful manager in the history of British football. In his homeland, Scotland, he's still revered for a remarkably successful stint as manager of Aberdeen FC in the early 1980s. A debate has now begun among sports fans over exactly how prominent will be the place that Ferguson occupies in the history of soccer. A general consensus is emerging, even among his foes, that he will surely be remembered as one of the greatest managers in the world, who transformed his club into a major brand — with fans across the planet. Betting has begun, too, over who will be his successor. His job is one of the most prestigious and high-profile in sport — but filling his boots will not be at all easy for his successor. On his home turf, the Old Trafford soccer stadium, Ferguson's looming presence is likely to continue to be felt, not least because he is staying on at Manchester United as a director and ambassador. He already has a statue outside the club's famous stadium. More honors are sure to follow from the Red Devils' fans who, in the coming days, will likely flock to see Ferguson's two last remaining games at the helm of one of the world's most glamorous soccer teams.